Bradley Wiggins has been told by his coaches that a podium finish in the Vuelta is possible – and he feels his form is as good as it was going into the Tour de France. Wiggins has been training hard since having an operation to repair the broken collarbone he sustained in the Tour, which only kept him off the bike for a week. Now, just days before the final Grand Tour of the season gets underway, the British national champion is hopeful of making up for last month’s disappointment. 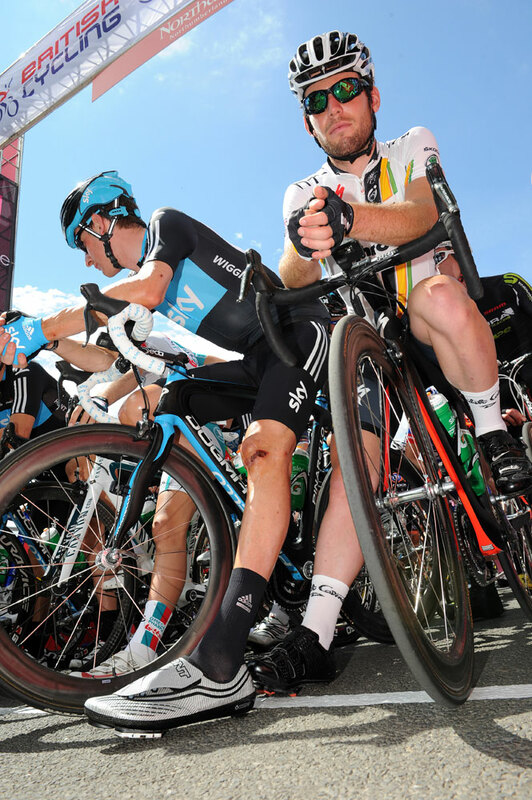 “Everything suggests I’m in as good shape as I was going into the Tour,” Wiggins said this afternoon. He continued: “The only thing is that I haven’t raced and it’s one thing doing it in training and one thing doing it in races. “But I’m in a great position to get the best out of myself, although at this stage I don’t know what that is. Initially it appears that the plan may have been for Wiggins to use the race as preparation for the Worlds, but this approach has been scrapped for two reasons. First, he wants to use this race as part of his development as a GC rider as he prepares for an assault on next year’s Tour de France. Furthermore, the gap between the Vuelta and the WC time trial in Copenhagen is similar to that which separates the Tour and the Olympic time trial in 2012. “Initially we were thinking we would ride the Vuelta and pick days where we sit at the back but I’ve gone beyond that level,” Wiggins declares. “With the team that’s been selected and the way I’ve moved on this year, there are not many opportunities to race a Grand Tour for the GC. “Everyone will look at me to lead the team and I have to put my hand up and say I’m going for it. 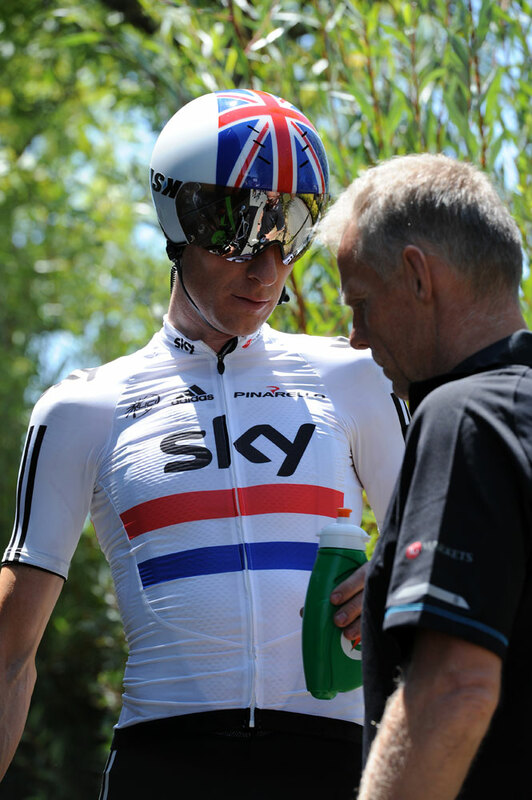 Wiggins opted against checking parts of the Tour route, and has decided to keep that approach ahead of the Vuelta. Aside from looking at some stage profiles online, he will take the race as it comes. “Three week races are a difficult thing to look at. There are nine days before the time trial, and my first goal is staying out of trouble before that. “Sierra Nevada four days in will be quite decisive, which is the highest finish of the race at 2000m. “The coaches tell me that with my training and the way I’ve been going they think I’m capable of getting on the podium. “Whether that happens or not is a different thing. The course is suited to me in some aspects – it doesn’t go to high altitude a lot which is an advantage, but it’s not going to be easy. He also admitted that he is still frustrated about the crash which forced him out of the Tour, and admits he’ll do everything he can to stay out of harm’s way in Spain. “I still kick myself a little bit for not riding on the front at the Tour and not taking it by scruff of its neck. Interestingly, while he admits he hasn’t spoken to Mark Cavendish about his plans for 2012, he thinks the Manxman joining Team Sky would do him no harm at all. “I think if Mark Cavendish ends up coming to Sky it will probably be best thing ever for next year’s GC because the sprinters’ teams tend to ride on the front for most of first week, and I could get a free ride when most of the crashes are happening. “But I don’t expect anything. Mark’s in the driving seat as he’ll have a number of teams he can choose from. “It will be fantastic if he does come, but I don’t think it’s a given,” said Wiggins.